A typical, practical and functional sea holiday yacht, the Bavaria 40 is a great boat to charter. Her layout is the classic of a sailing yacht with 3 cabins and 2 heads: two aft cabins, head on the port side and chart table at starboard, walled galley and comfortable bow cabin with private head. The cabins are very spacious, larger than those on the previous model. A strong feature of this vessel is ventilation, ensured by her many hatches and portholes. In addition to the standard equipment found on all our boats, our Bavaria 40 Cruiser, Galateia, carries a few extras which improve her quality: heating, mainsail furling, bow and cockpit in teak. 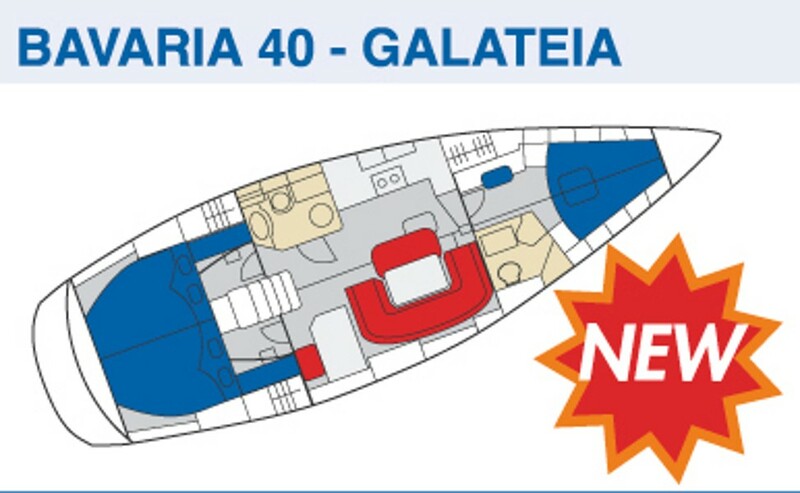 Galateia is 12.30 m (404) long and has a 3.99 m (121) beam. She is equipped with a 56 hp Volvo engine, which allows about 7.5 knots cruising speed. Gennaker is optional.